Chasing some cool barking sounds? Want to freshen up your ringtone collection with dog barking sounds? Check our app for cool dogs barking! One of the commonest sound dog makes is barking sound, and if you like dogs, you would probably like to have a barking dog sounds in your mobile. In our barking dog app you will find sounds and ringtones that will entertain you wherever you are. 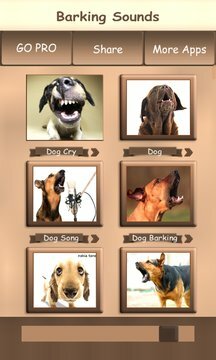 No matter what dog breeds you like, you will find diversity of dog noises and dog barking sounds, so don`t miss out the fun. This app is bringing different barking sounds you can have fun with or have fun with other people, kids or even other pets. Play dog sounds from the app to your dog and see how he will react to other dog barking. This app is great for kids because it is funny and interesting. Also, this app has many different uses, for example, dogs sounds can be used to scare people, neighbors, or maybe even to deter home invaders. Also, you can set a dog ringtone as the alarm to wake you in the mornings, and never oversleep again. To be honest, mobile devices are powerful tools of entertainment and people search for attention-grabbing ringtones. Dog sounds and dog ringtones are sure to attract other people`s attention, they are good to have at hand, so this app is a must have for all dog lovers. On the other hand, all ringtones in this application are free ringtones, dog sounds free can be yours at no cost. Dogs are great to have fun with, so if you enjoy playing with dogs, you will certainly enjoy playing with our collection of different dog sounds. If you don`t have a dog you can have man`s best friend in your device in the form of dog bark and dog barking sounds and still have fun. So, if you are not in the mood these days, and need something to cheer you up, you are on the right spot! Grab barking sounds app and enjoy to your heart`s content! But for the most part, you will enjoy it, spread some cheer and make people smile.